The Star Wars franchise has greatly changed since the first movie in 1977, but in all 6 films there was one character that remained invariable. It is R2-D2 - famous, adorable droid and the faithful companion of the game's protagonists. Yesterday Lucasfilm announced that R2-D2 will be featured in the new Star Wars. Recently we have reported that Han Solo, Luke Skywalker and Princess Leia will appear in Star Wars: Episode VII, but this information hasn't been officially confirmed yet. What we know for sure is that R2-D2 will be presented in the upcoming movie. Moreover, two big franchise's fans have already been hired to make the droid that will be featured in the film. 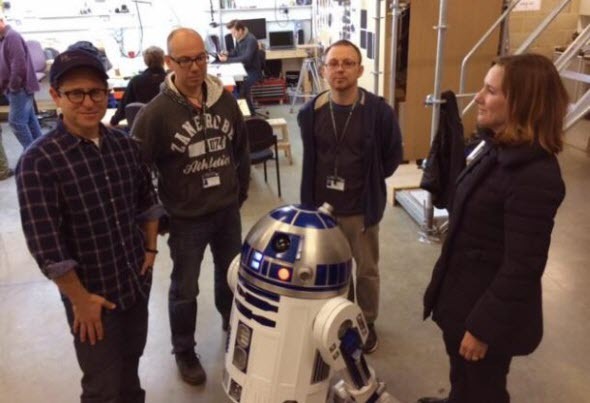 These lucky persons were photographed with J.J. Abrams (movie's director, producer and scriptwriter) and Kathleen Kennedy (Lucasfilm's boss) last week. As you can see, R2-D2 is also presented on the photo, but soon he will be redesigned, and this updated version will appear in Star Wars: Episode VII. "What we do need to do is improve on the mechanics," - says one of the droid's creators about the development process. Are you waiting for Star Wars: Episode VII movie? Are you excited about R2-D2? Which character do you want to see in the next part of the instalment? We will be happy to read your comments in the relevant section below.